Greentek India: Govt. plans to set up 4,000 MW of solar thermal capacity in Rajasthan. Govt. 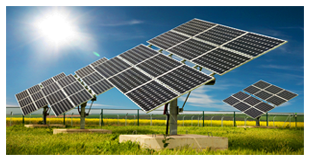 plans to set up 4,000 MW of solar thermal capacity in Rajasthan. Making it the next hub for solar power in the country, government plans t set up 4,000 MV of solar thermal power capacity in Rajasthan. "we have discussed the plant with Rajasthan government and we aim to set up as solar thermal capacity near the Sambhar salt lake in Jaipur," said Farooq Abdullah, union minister for new and renewable energy. This facility will be largest solar thermal part in the world, "It will be commissioned in phases. The first phase would be of 1,000 MW", said Abdullah, This would be the first such solar thermal power pack in the country. The only solar park in the country is based in Gujarat with current capacity of 214 mw and is expected to generate 500 mw when fully commissioned in 2014. The park however acomodated only solar photovoltaic facilities. Rajasthan currently has 660 mw of soalr power generation capacity and 2,700 mw of wind power.